Architects, designers and design students make LBD:MA programs possible. At weekend Family Design Days @ BSA Space, volunteers work with families to design and build models focused on the theme of the month. Volunteers in a school or community setting may work with students for one session at a time or for a full six-session program. In one session a volunteer might lead an architectural walking tour; introduce students to sustainable design, or work alongside a LBD:MA design educator during a student design project. Over the course of several sessions a volunteer might help a group of children draw floor plans, build structural models, or set up a scale-model city. A volunteer might also show a high school class what architects do, or read stories about houses to kindergarteners, or help us to “teach the teachers” in professional development workshops. Design Educators are Architects and Designers who have volunteered with, and been trained by LBD:MA. 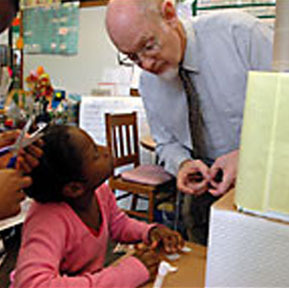 Design Educators typically plan a program with LBD:MA, then teach the program independently. By attending LBD:MA training workshops and volunteering in youth programs architects can self report community service credits for AIA, earn NCARB Intern Development Program [IDP] and LEED AP volunteer hours. This workshop is a friendly, hands-on introduction to the world of K-12 architecture and design education. Architects and designers come away with the skills and knowledge to become a LBD:MA volunteer; or enough background and resources to upgrade a next visit to a neighborhood school. This workshop is typically offered on a Saturday morning at BSA Space.